A bitchin' superstrat, dude! EXCELLENT! Now, if only my photography skills had gotten a tad better since the last thread. Ahh, that'd be nice... Still, it's easier to blame my 5 year old second hand phone camera. ANYWAY, what did I get? Well, here it is. UPDATED WITH (hopefully) MUCH BETTER PICTURES! Initial thoughts after a few hours of play are really positive. 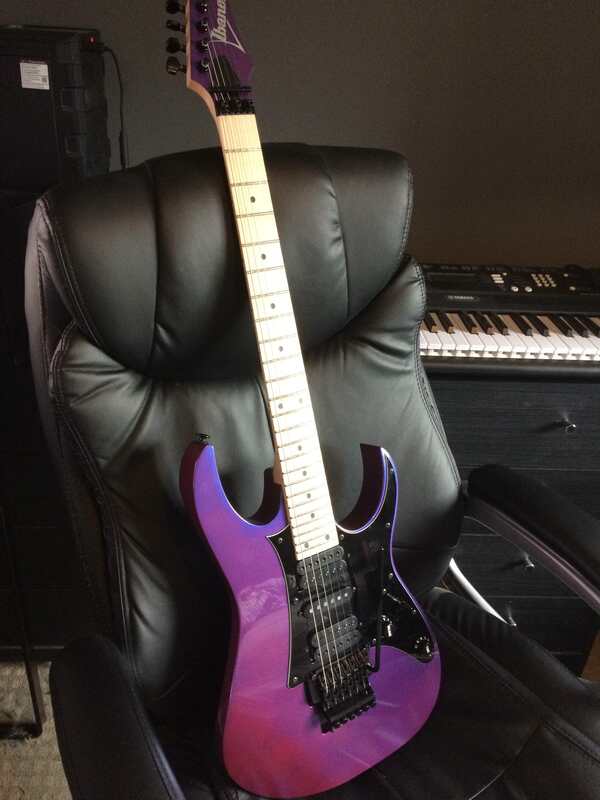 As someone who's only previous experience in 16 years of a floating trem was with an Ibanez EDR470EX (I believe that was the model... The green Satriani looking thing), I've been blown away by just how stable (and sensitive) the trem system is. I've been diving like Raheem Sterling & the thing still holds a perfect open G chord as it did when I first set it up. 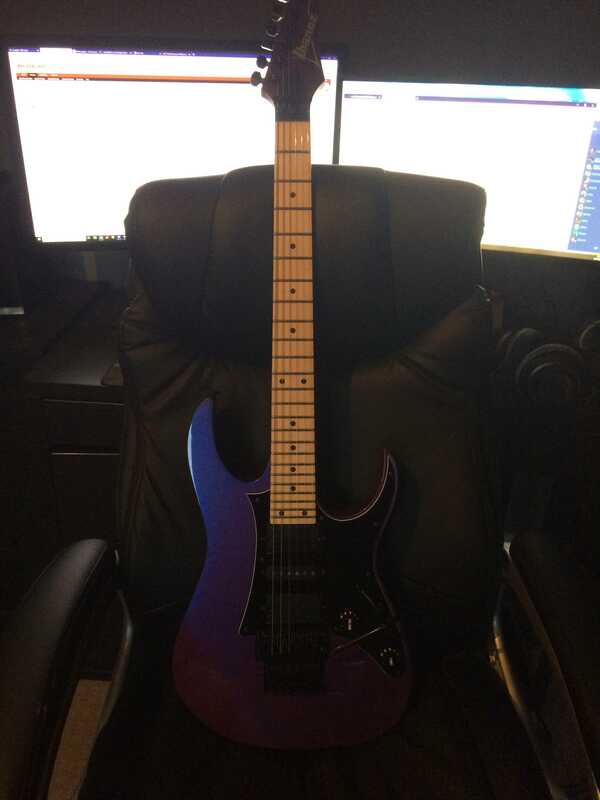 Intonation is very slightly out on the high E/B strings (I've a pretty sensitive ear), but probably only by a few cents - I'll fix it at some point, but right now, I kinda just wanna play it. Bridge pickup sounds EXACTLY how I imagine a superstrat to sound, but the neck pick-up isn't really blowing me away right now. Inbetween positions are gorgeous for the clean sounds I usually play with, so I'm loving those for delay-ridden clean arpeggios. Neon Pink, or Neon Green for a strap? That's lovely, I do like a nice RG - congrats! Looks like the bright light from those monitors has sucked all the colour out of the rest of the image. Bogus! Spin the chair around, or take another pic with the light behind you, shining on the guitar. Wouldn't that require swapping the pickups out for Evo's? I can't find just pick-up covers on their own, sadly. Yellow knobs though eh? 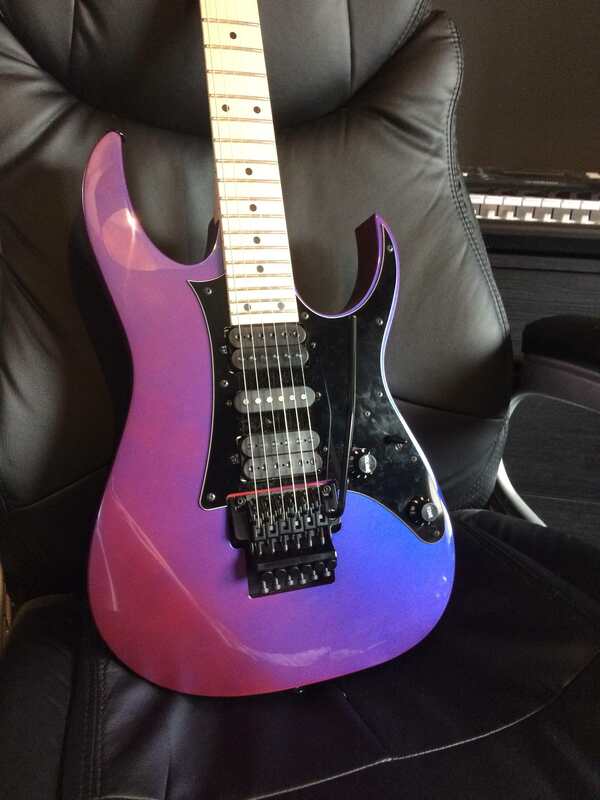 I DO want to make it as garish as possible, so if you think a purple guitar with a neon green strap & yellow knobs is the way to go, then so be it, haha. I discussed this with my wife and it must be Neon Pink. So every woman asked thinks pink, while everyone else (assuming sweepy's gender here ) says green... But the idea is that it looks atrociously bad in a good way! Delightfully tasteless. I'm lusting for an obnoxious superstrat myself. Lovely RG. Strap wise I'd say a dimarzio cliplock for old school shred authenticity. 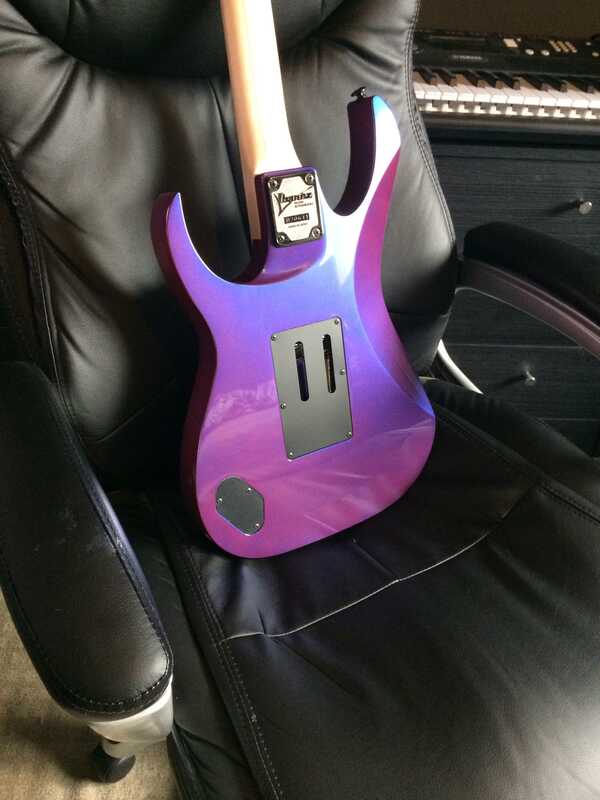 They do a purple one too. It's just finding the right combination for maximum tastelessness. 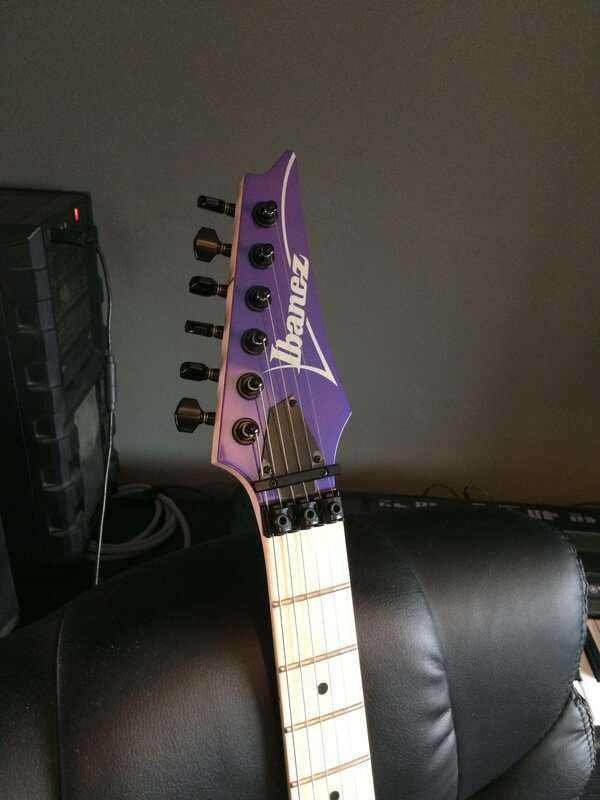 Also I don't think it's tasteless but then again I remember the days when yearly Ibanez catalogues were a book of dreams and aspirations back when I was a young player. Hence the soft spot I guess. Haha, perhaps that's the wrong choice of word. Just something over the top and garish, y'know? But yeah, can anyone educate me on pick-up covers? Say if I wanted some of a certain colour that still gave room for the poles, would it be a simple thing to find/install myself? 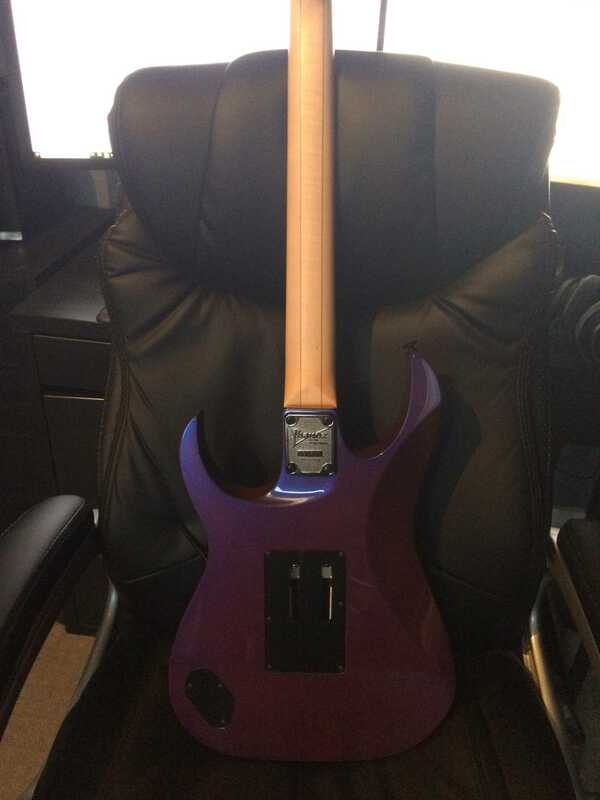 Or would I be looking at buying the custom built, & having someone experienced install it? Purple tiger stripe fur strap, obvs. Cheers everyone I'll throw some pics up when it's finally done. Haha, believe me, I've thought about it. 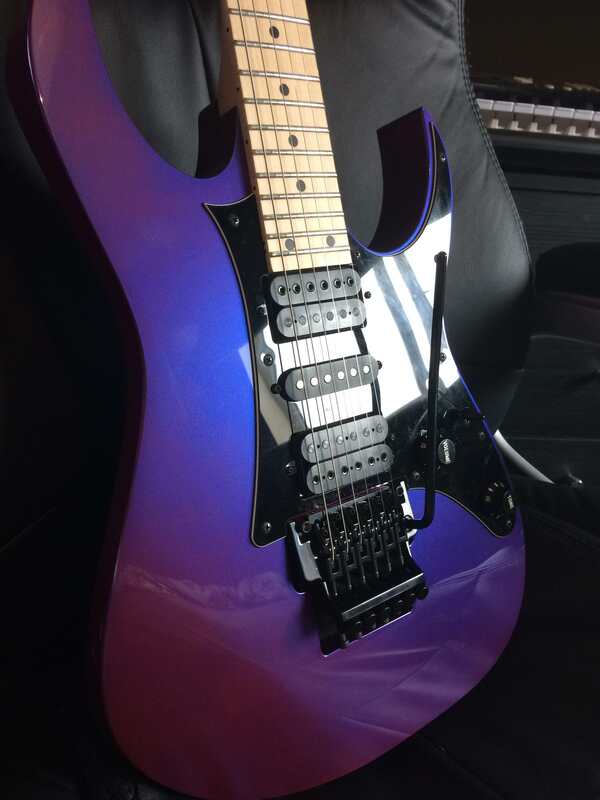 I've also thought about dialing it back some, and having the blue/pink/blue/pink/blue pickup combination with a pink strap & knobs, but that'd make it relatively normal (and I don't wanna buy another strap anyway). I also spied some pretty nice custom plates on Reverb & elsewhere, although I'm yet to see anything which makes me want to instantly buy it. Bloody hell, it's a lovely colour if nothing else.